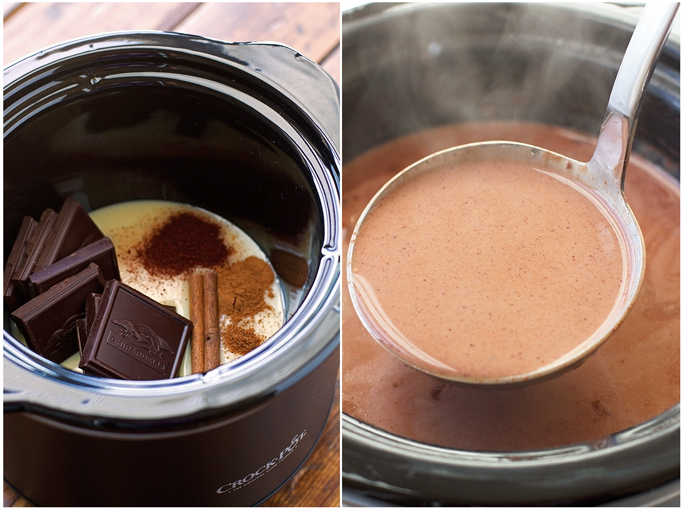 A Mexican hot chocolate recipe that requires you to just toss everything in a slow cooker and let it all cook up. 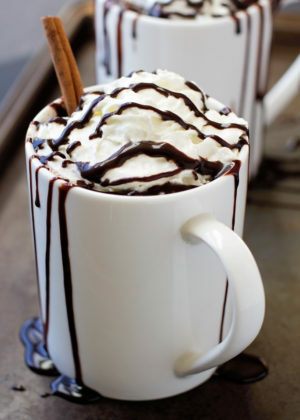 This hot cocoa is made with melted chocolate, not just cocoa powder, spices like cinnamon and a hint of chili powder. 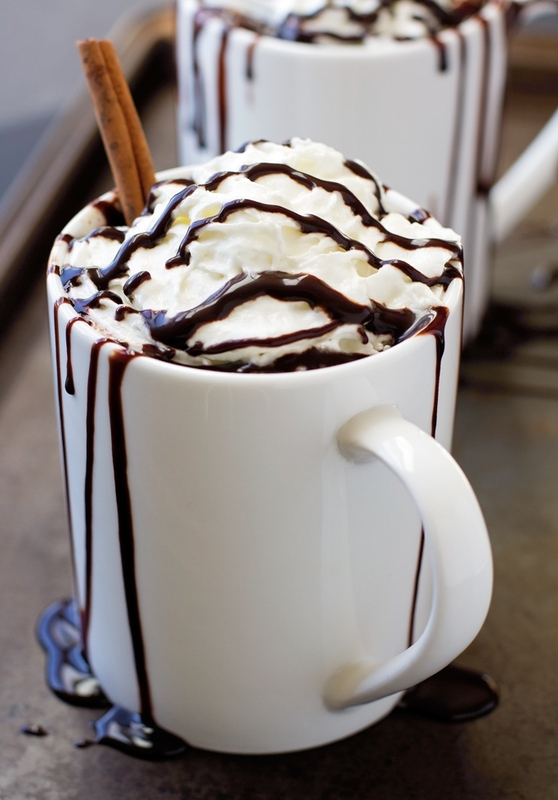 The flavor is so rich and delicious, just the way hot chocolate should be! Livin’ la vida hot chocolate. Bittersweet chocolate, cinnamon, nutmeg, condensed milk, and a hint of chili powder. How Ahh-mazing. <– I’m sure you’ve figured out that that is not the traditional shopping list for hot cocoa. That’s because we’re doing a twist of the traditional hot chocolate today! Hot cocoa is the stuff that childhood dreams are made of. And if your childhood was anything like mine, then Swiss Miss hot chocolate was definitely a staple. Swiss Miss was perfect for my childhood, mainly because I didn’t know any better. I gave it a try a few years ago and honestly, I can’t figure out why I liked the stuff. It’s got the faintest hint of chocolate. I’m suspicious that I probably wasn’t a hot cocoa snob when I was 5. I don’t expect my hot chocolate to be a bar of chocolate in liquid form, but shouldn’t a beverage that’s got the word ‘chocolate’ in it’s title have a significant amount of chocolate in it’s contents? I think so. 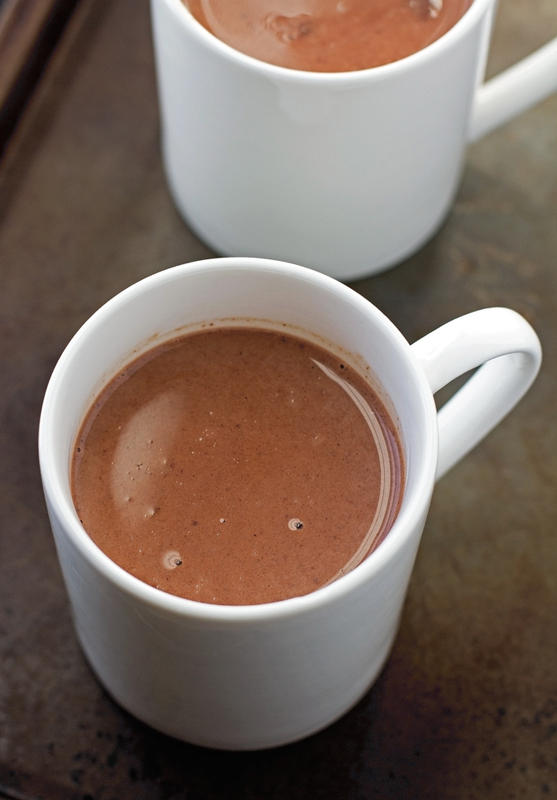 Mexican hot chocolate is slightly different than the traditional stuff we’re used to. I find it to be a tad bit thicker, it’s spiced with cinnamon, nutmeg, and a hint of chili powder. Don’t worry the chili powder is no way strong enough to be spicy, it just adds a little heat. It’s comforting and cozy. The spices are meant to be subtle but add so much flavor to the chocolate. If you can toss everything in a crockpot and stir it twice every hour, you can make this recipe. Warm, comforting, and perfect for the holidays. It’s kind of crazy that it wasn’t until recently that I tried to actually make homemade hot chocolate. And what’s crazier is that I didn’t even think good hot chocolate could come out of a crockpot. But, oh how I was wrong. The flavors have a chance to really sit and enhance as they are slow heated. I make this stuff all the time now. In a small bowl combine the hot water and the cocoa powder, stir until smooth. 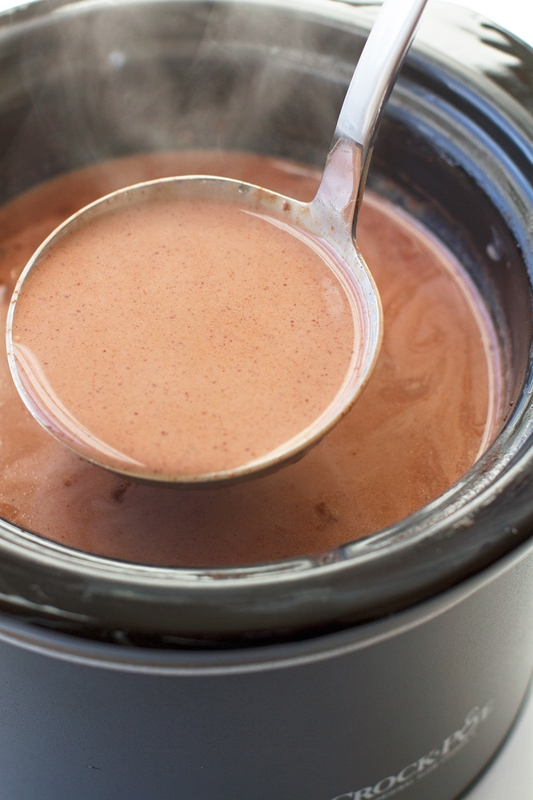 In the base of the slow cooker, add the bittersweet chocolate, condensed milk, cinnamon stick, cinnamon powder, nutmeg, chili powder, whole milk, along with the cocoa powder mixture. Heat on low for 2 hours, stirring every 30 minutes or so. 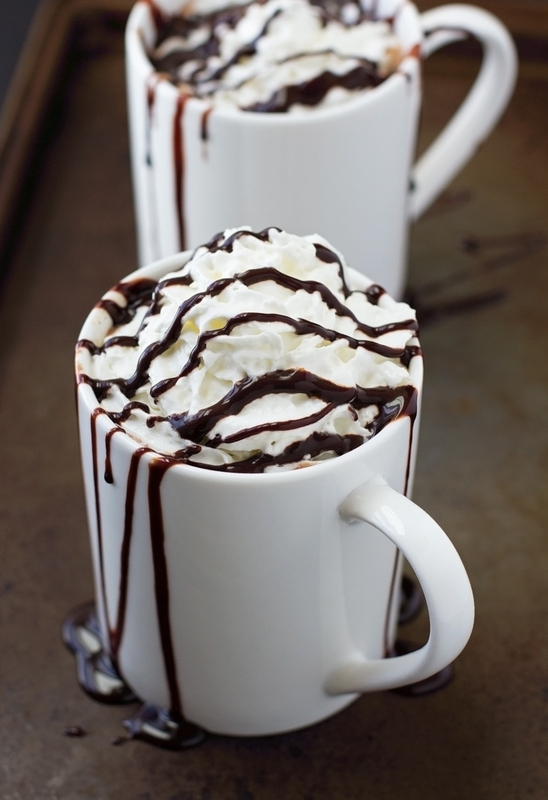 Serve warm with marshmallows, whipped cream, chocolate syrup, or chocolate shavings. I’ve used chocolate chips in the past but this can really be a hit or a miss. For best results, I suggest using chopped chocolate.